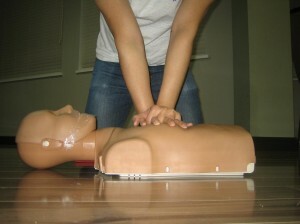 Pictured above is a trainee performing CPR on an adult training mannequin. CPR training has been around since the 1980s, with numerous health care organizations formally endorsing the skill for the public to learn almost a decade later when formal guidelines had already been created. The American Heart Association is responsibile for the research and publication of such guidelines, in both basic and advanced CPR. Programs are typically created under these two guidelines under the categories Basic Life Support and Advanced Life Support. We have a total of eight programs available all week, sometimes even during the weekends for more popular classes. Out of these eight programs, 5 are training programs and 3 are re-certification classes. Whatever the student needs – just training or credentials – we have it. According to a recent survey, about 90 percent of Americans recognize that severe chest pain is a symptom of a heart attack. While this is correct, severe chest pain that is unresolved by rest or medication is a late symptom of a heart condition. There are a lot of early signs and symptoms that people should be aware of but are not. This causes a lot of cardiac arrests to happen outside of a hospital – something that is quite dangerous because patient outcomes are very low. Cardiac arrest is the medical term for a heart attack. It happens when a cascade of events causes the heart to stop beating regularly or entirely. CPR is used to help return the spontaneous circulation of blood in the body through compressions and ventilation. Defibrillation is also a skill included in CPR, but can only be done if an AED – automated external defibrillator – is available. What do I learn in a CPR class? There are three basic skills in giving CPR: compression, ventilation, and defibrillation. When you enroll in a Basic Life Support class, these are the three that you will focus on. Chest compressions are done with two hands (for adult victims) or one hand (for children). The hand/s are placed in the middle of the chest on top of each other after which the chest is depressed by at least 1/3 of the AP diameter (front to back). Compression depth for adults is 2 inches while for children its between 1.5 and 2 inches. Compression rate is at least 100 a minute. Ventilations are given after compressions, at a ratio of 30 compressions to 2 rescue breaths. This ratio makes up one cycle. Defibrillation uses an AED to send electrical shock to the heart. However, this is only done if the victim has a detectable heart rhythm, not in asystole or flatline. The electrical shock comes from the AED and is sent through pads placed on the chest to the heart. Our providers have eight certification courses available.